Another spectacular evening was spent reveling on the pool deck at the “White Night” party. Guests are encouraged to wear white and almost everyone did, with one gentleman donning the white terry robe and slippers left in his closet! At dusk the Azamara staff clears the pool deck of loungers and replaces them with tables set with crisp white tablecloths. Enchantingly, the deck is transformed into an elegant al fresco dining venue. There’s a live band and a buffet and barbecue with no other than the captain himself grilling the lobster tails! !We ate, drank and were all quite merry by the end of the night! Then there was the evening we left Amalfi and were seated in the dining room getting ready to order dinner. A waiter approached our table with a tray of the largest cannoli I ever saw. 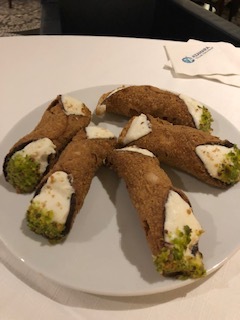 Seeing our startled expression, as we hadn’t yet had our meal, he explained that the dining manager realized that with guests running here and there all day to see and do everything they could, maybe there was little time to stop into a local bakery to taste a genuine, freshly made cannoli. So they actually sent someone off the ship to pick a few hundred so guests could savor the delectable pastry after their evening meal! Really? Yes! 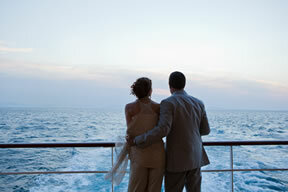 What other cruise line does this? I’d bet none! The last magical memory I’ll share with you happened on an evening we were sailing past Stromboli Island, a small island in the Tyrrhenian Sea off the north coast of Sicily, containing one of the three active volcanoes in Italy. As a matter of fact, it is one of the world’s only constantly active volcanoes, erupting every 15 to 20 minutes for the past millennia. Each small explosion shoots bursts of magma into the sky and sends rivulets of lava into the sea, and the captain made an announcement early in the evening alerting us to the time we would be passing by. When the time came, the captain made another announcement (directly into the staterooms which is rather unusual) and his excitement could hardly be contained as he encouraged all guests to head outside for a look.Although many were able to watch from their balconies, many more headed to the upper decks. The captain then stopped the ship so we could enjoy the “show”. 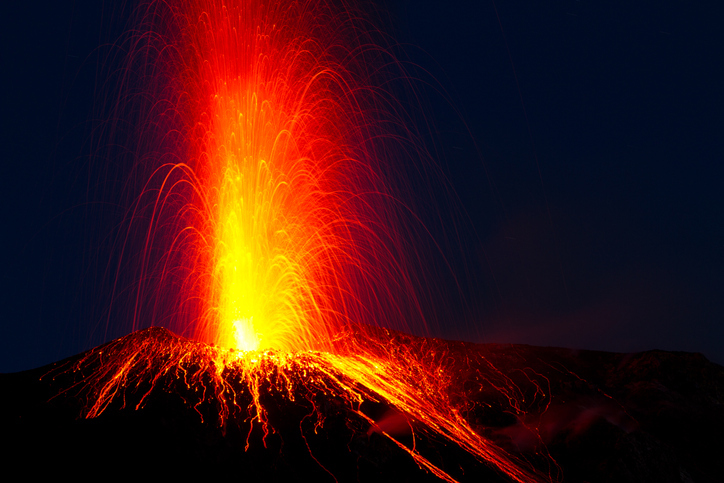 Stromboli did not disappoint, and with every eruption, the guests cheered! It was a special evening witnessing this awe-inspiring wonder of the natural world.